Congratulations to our Zinio Subscription winners: Anne K, Allison, Kira, Beki, nfisher118, O_o, Kitty with String, and Glen Fandf! Please send me your First Name, Last Name, email address and the name of the publication you would like by 20 Dec 2012 so I can get your prizes activated.Send me a private message via twitter or email me at ajoyfulgirlknits@gmail.com. Congrats again!!! This labor of love has begun. I have set out to create three upcycled quilts made from flannel I have rescued. This year I am making quilts for my inlaws. 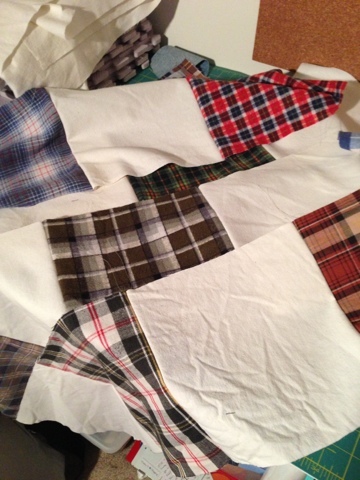 My dear husband's mother and two brothers will get quilts made from his grandparents old flannel shirts. I do this not out of my love for them but, out of my love for him. We recently moved away from them and I feel a need to stay connected. My husband and children need this part of our family in their lives but I am not sure how else to send love but through the mail. It sounds like I don't really like them, but I do. However, the love for my family is deeper. I will do this thing for them to keep the home fires burning.